Tales from the White sea. Bearded seals. 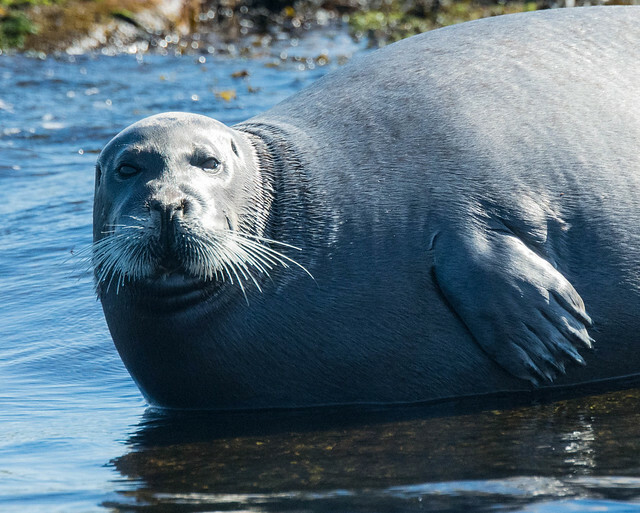 Bearded seal is the biggest species of pinnipeds in White sea. We found those guys on the Top island near Solovetsky archiplago. The isle of Top is small, ibnhabited rocky island with the lighhouse in the middle. This silent and remote place gives you feeling of primal magic. Rocks of the island are covered with bearded seals. When the tide is getting low, bearded seals relaxing laying half-water on the rocks and wait for water to go away. This is the best moment to see them either from the boat or from the shore. Seals are adapted for living in the water, so they feel vulnerable while being on the shore, and jump into the water immediately when the boat approaches them. Some seals are more calm and feel comfortable being several meters close to people. Once we woke up a seal sleeping on the surface. In several years population of bearded seals increased in the result of hunting ban in the White sea. This is a good news for us, but local fishemen are not so happy about population reсovery – bearded seals get caught in the nets, destroying it and even dying inside. I made several efforts to take underwater pictures of bearded seal, which will be published a bit later.